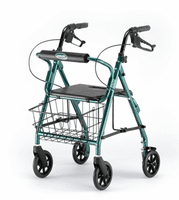 Rollators, Rolling Walkers, Invacare Rollators, Drive Rollators and Lumex Rollators. Scroll down to see our selection of Rollators and Rolling Walkers for sale. Rollators and rolling walkers are used widely by elderly or disabled persons with limited mobility. We carry an extensive selection of rollators and rolling walkers from all the top manufacturers including Drive rollators, Invacare rollators, Lumex rollators, Marry Walker rolling walkers and PVC rolling walkers. What are rollators and rolling walkers? Rollators and rolling walkers are devices on wheels that assist in maintaining balance and stability while walking. For the elderly or disabled, rollators and rolling walkers are essential equipment needed to get from one place to another safely. Ambulators are a type of rolling walker that surrounds the user, giving additional support for patients undergoing rehab or physical therapy. These types of rollators and rolling walkers are large and mostly found in hospitals, institutions and facilities housing long term care patients. With an increase in falls, the use of a rollator or rolling walker can greatly reduce your chances for injury..